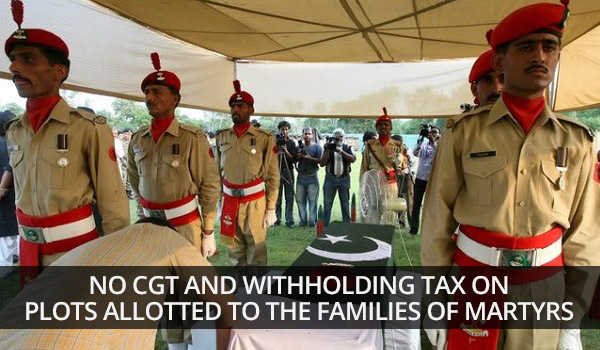 Islamabad: The Federal Government has decided to exempt plots allotted to heirs of armed forces martyrs from Capital Gain Tax (CGT) and Withholding Tax, states a news report. According to details, an ordinance will soon be prepared to make this exemption official. Previously, confusion existed about the implementation of taxes on the plots allotted to the families of martyrs, which will be clarified through this ordinance. Reportedly, Federal Board of Revenue has prepared the ordinance draft, according to which the first time sale of plots allotted to families of martyrs will be exempted from CGT and Withholding Tax. The ordinance will soon be approved by the cabinet or presented in parliament.